A showdown between the Conservative government and environmental opponents unfolded Monday across the country on two fronts—one online and the other offline. Online, over 500 websites went “dark” to show solidarity with organizations opposed to the Harper government’s proposed changes to environmental protection laws. Offline, 10 ministers from the Harper government had press conferences in cities across Canada to show support for Bill C-38. In one such conference in Quebec, Natural Resources Minister Joe Oliver criticized the “exaggeration, distortion and outright falsehoods” expressed by the bill's opponents. 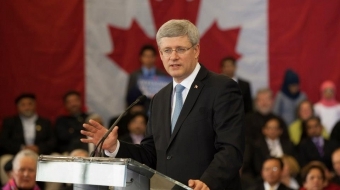 Bill C-38 would give the government greater control over the environmental assessment process. This includes setting time limits and 'streamlining' the dual review process at the provincial and federal levels into one. The main issue at stake for critics is the autonomy of the environmental review process from federal and commercial interests. Their goal is to separate the proposed changes from Bill C-38 to be reviewed separately by parliamentary committee. Notable Canadians supporting the Black Out Speak Out campaign included environmental activist David Suzuki—who recently had to step down from his position at the David Suzuki Foundation due to negative attacks from Conservative critics—and award-winning author Margaret Atwood. “You voted for Me as Hot Dog pic :-0 re: 325K T-follower celebration! Signed for you! June 4 is http://www.blackoutspeakout.ca, so it will be the 5th,” Atwood tweeted on June 3. 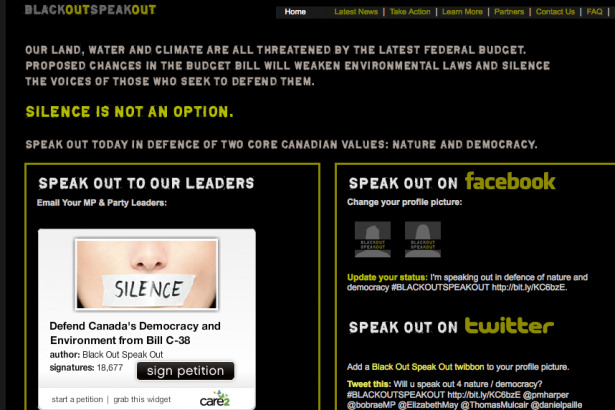 Meanwhile, Canadians engaged in lively discussion and debates online about the Black Out campaign and Bill C-38. Many users opted to add a Black Out Speak Out "twibbon" to their user pictures to show support for the campaign. Here is a recap of some of their discussions.